It seems that the calamari in American sauce, and consequently the American sauce, are not really native to the continent that its name suggests. It is said that the American sauce has its origin in a recipe that It sounds very similar to its name: Armorican sauce. The region of the Armorica is in the north of the French Brittany, and therefore, this places our recipe in a totally unexpected place. Guess what ? For this recipe we are going to need a lot of tomato sauce. So, what better than a good homemade tomato recipe? That's why I leave here the link to our tomato sauce recipe. With regard to squid, buy them fresh and tell the fishmonger to clean them to save you a little time. 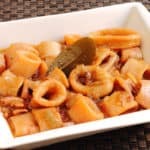 Cooking recipe to prepare some calamari in American sauce, step by step, and without any difficulty.Remember that the amount of squid indicated in the list of ingredients, corresponds to squid already clean. Then, we will cut them in the form of rings between a centimeter and a half, and two centimeters. If we can get them delivered to the fish shop already cut, the better. Now we will put the squid in a large colander to lose some liquid, while we take care of other stages of the recipe. The next thing is to peel the onion and cut it into very small cubes. If we dislike this task, we can entrust the work to a kitchen robot (if we have one), but at minimum speed so that the pieces do not remain so small. We will also peel the garlic and cut it into small pieces or slices. As before, we can leave this task to the robot. Then, we will warm up a good squirt oil in a large skillet and sauté with onion and garlic. When the onion begins to become slightly transparent, add the pieces of squid. We will leave them to be poached for 10 minutes. We will add the jet of liquor (generously) . Remove everything, lightly, and let the squid cook 5 minutes more. Some people prefer to wave squid at this point. Then we can add the sauce of tomato, chili or chili pepper, bay leaf, teaspoon of sugar and a pinch of salt. We will stir everything and cover the pan, to leave cooking the squids for 15 minutes. That is all. After this time, our calamari in American sauce will be ready. If you do not like spiciness, you can replace chili pepper or red chili with a couple of teaspoons of sweet paprika. If you prefer, you can also replace the pepper with a teaspoon of Tabasco sauce. To add more color and flavor to the sauce, you can add some cuttlefish ink, if you have it. This same recipe also works for cooking octopus, so if you want to change the dish one day, go ahead: it will be excellent. If you want the sauce to thicken or shrink, you can let it the dish is cooked a few additional minutes, towards the end of the recipe, removing the lid of the pan. In principle, the original American sauce should be prepared with a base of fish fumet. Certainly, adding this ingredient would give much more pleasure to the dish, although it would take more time to be ready. In any case, it's a great idea, so I'll leave you with our recipe for fish broth, in case you need it. You can accompany these calamari in American sauce or with a simple white rice , so as not to waste a drop of the sauce. 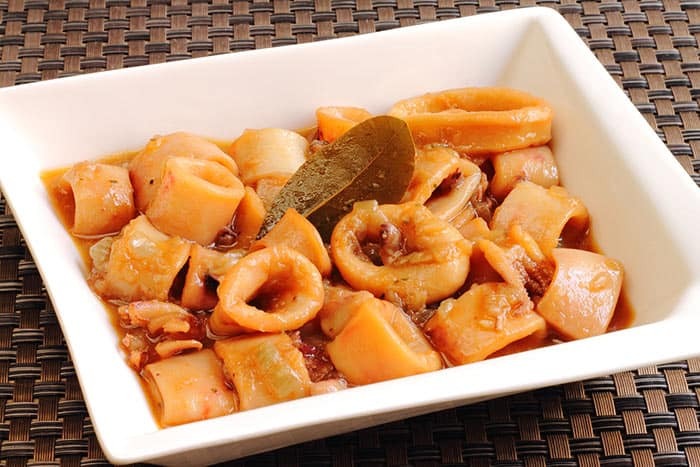 There are those who, instead of using the liquors mentioned in the list of ingredients, prefer to add dry white wine, when they prepare the squid.